The squat clean is a hugely important exercise for building full body strength, health and fitness. In comparison to the power clean, the squat clean requires faster hip and elbow turnover as well as placing a higher demand on speed, footwork, and hip mobility. The squat clean allows you to lift heavier weights than the power clean. 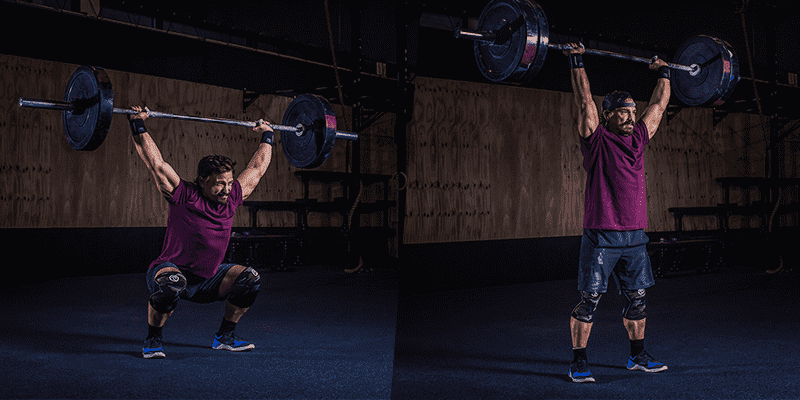 If you want a decent clean and jerk – an essential lift for both weightlifting and CrossFit® – then you need to put effort into improving your squat clean. This exercise will significantly help to build long term strength, power and enable your full potential as an athlete and a healthy human. Rehband athletes Josh Bridges, Camille Leblanc-Bazinet and Annie Thorisdottir all competed in the squat clean ladder in the last CrossFit Games®. This event involved 30 lifts of progressively heavier weights, and demonstrates the importance of this lift within the sport. Having an entire event devoted to this single lift clearly shows its importance as a functional exercise within the sport. When performed with the correct technique, with weight being built up progressively over time, this exercise is a great tool for strengthening the core. Core strength stabilises your body, improves your posture, protects your spine and helps you to generate and control force and power. Good quality movement has many positive knock on effects for long term health and is instrumental in helping you to prevent injury. A better squat clean will lead to significant results in other exercises in your workouts and performance. The full range of motion for a squat clean involves a front squat, so these two exercises have a symbiotic relationship. Work on one and it will help to improve the other. You will also start to find exercises such as wall balls and thrusters easier as your increased mobility, strength and movement from the squat cleans is transferred. Additionally, squat cleans will help you develop more explosive power and speed for push presses and any exercise that requires a strong leg drive. The squat clean requires good mobility to perform correctly. As a result, work on your hips, ankles, shoulders, elbows and wrists will all allow you to move more effectively and lift more weight. This improved mobility will then help your performance in other areas. A solid squat is an important foundation for many other execises. As with all weightlifting, focus more on moving the bar with speed and good form at first, rather than worrying how much weight is on the bar. The weight will come if you have good technique and generate a lot of power by moving the bar with some speed! You should never sacrifice form for more weight when doing your working sets. Using hookgrip, grip the bar slightly wider than where the knees are positioned, so that the knees touch the arms. Never let the knees and legs track inwards at any point during the lift! TIP: If you have long arms, try gripping slightly wider. This will bring the bar a little higher on the hips during the first pull and can give better leverage for the Clean. This phase involves the movement from the ground to above the knee (mid-thigh). Push the knees back, keep your back straight, shoulders still in front of the bar, arms still straight, end mid-thigh. Maintaining a vertical back, push your knees under the bar (bend slightly) and bring the shoulders back. As you rise up into a standing posture (known as the “power position”) this puts you in a good position to explode the weight upwards onto the shoulders. Some people like to row the weight slightly at this phase of the movement and do a hip clean with slightly bent elbows. You can keep your arms straight, or bend the elbows slightly at this phase, but this is really a personal preference. People have success with both styles. Extend, shrug and drop below the bar to complete the catch. TIP: To jump or not? 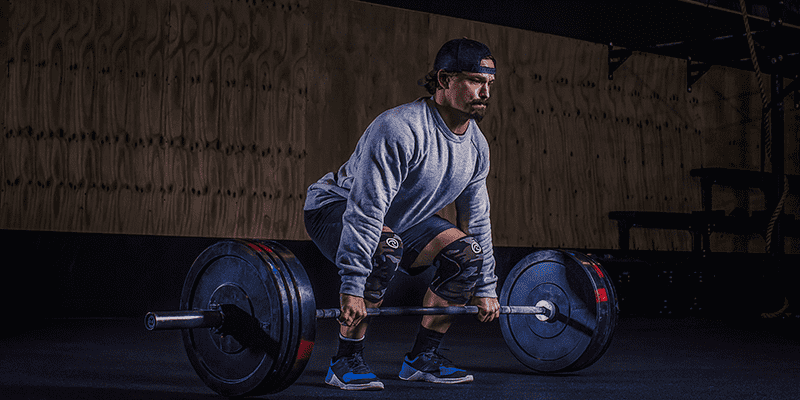 Justin Thacker,founder of The Lab and competitor in over 100 Olympic Weightlifting, Strongman, & Powerlifting competitions since the mid 1990s, teaches this phase of the squat clean as a jump when an athlete is learning (in order to produce more explosive power), then forces them to avoid the jump once they become more proficient. As you get more experienced, you can improve your speed under the bar and won’t need to drive the bar so high. This will allow you to lift more weight and make the entire movement of the exercise more efficient, saving you more energy. This is especially useful for longer workouts involving high repetitions, where it will make you a more effective athlete. Drop below the bar with speed. Use the shrug phase not so much to pull the weight upwards, but more to pull yourself under the bar much faster. Support movement – in terms of balance, coordination and muscle activation. Provide feedback to your body by increased receptive input from the knee. 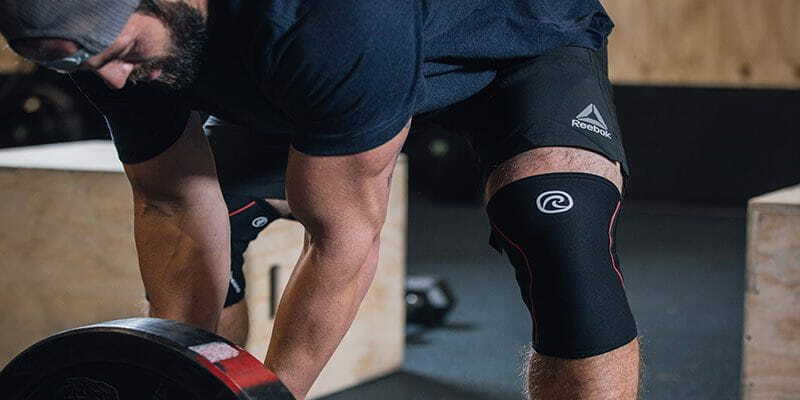 Keep the knees warm throughout your training. The advantage is not only in winter. This 7mm thick knee sleeve offers powerful stabilisation for heavy lifting and extra support during rehabilitation. Historically, the 7mm has been most used by weightlifters needing extra support during a lift, but today it is also common in gym fitters for those doing heavy lifting. 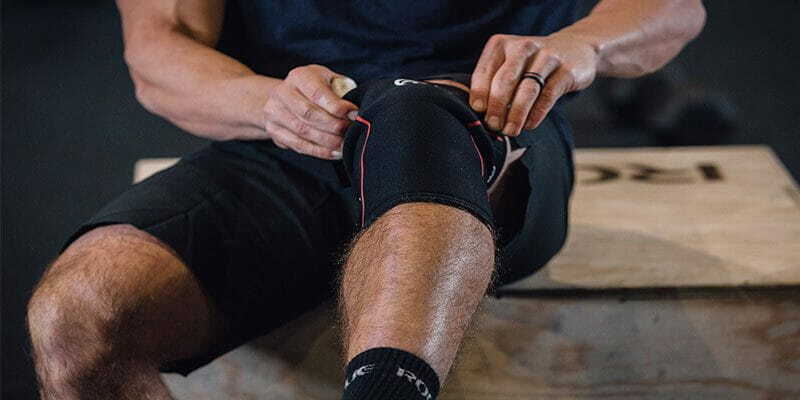 The 7mm gives a very distinct receptive input and awareness of the knee, to ensure that shorter activities are performed more precisely and securely. Good front rack mobility can take time to develop, so open your hands if you are not able to grip the bar fully. This is the optimal position to work towards, but an open hand works just fine in the meantime. Here we can see the importance of the squat clean for other lifts. The bar path should travel upwards in a vertical line. Bring elbows up and back, then rotate the elbows around the bar. Don’t curl the weight. The bar should be caught on your body, around collarbone height, tight to the body and as high as possible. You don’t want the bar to crash down onto you but catch the bounce. Try to time the catch so that you control the last few moments of the descent and can use the momentum to start to rise again. This also stops the rise to your feet phase of the exercise from becoming a dead stop, which makes things much more difficult. Where possible, the catch should be smooth. Keep an upright torso position for the catch, front rack and when you rise upwards in the front squat position. If you find that you keep falling or tipping forwards in the ascent, poor ankle mobility is often a cause, but consult with your coach before you make any self-diagnoses, and they can help you with the exact mechanics and what to work on. Keep elbows nice and high, with the bar resting high on the shelves of your shoulders. Catching the bar in a strong rack position will give you a much better chance of controlling the ascent and completing a successful rep.
Keep the bar path as vertical as possible throughout the entire lift. You have to pull that bar with all your might, utilising a strong hip drive and extension followed by a do-or-die rapid movement underneath the bar with the elbows up in full confidence.